Ha ha. That title should not surprise you. I am always up to something. I have projects going all of the time. Today, I have a crockpot full of cabbage stew cooking. It smells delicious. I used ground turkey as the meat in this batch. I often use purchased Italian meatballs that I cut in half -mmm. The ground turkey was on sale, so I couldn't resist. The rest of the cabbage (2/3rds of a large head) went into the my first attempt at making sauerkraut. I read several recipes; watched several videos on youtube and thought about it for some time. It certainly sounded easy enough. And, if it works as promised, it is really easy - although a bit messy. I have this jar setting in the laundry room (I did all the laundry this morning.) It needs a place where it will not be disturbed and does not get sunlight. Most of the time my laundry room is pretty dark. In one of the videos that I watched, the man who was demonstrating used a food storage bag filled with salty water to act as the airlock. I thought it was a great idea - and certainly simpler than making an airlock lid. The reason for salt water is this: If the bag leaks, it will not dilute the brine. My kraut is simply cabbage and salt. The liquid in the jar is the brine created by breaking down the cabbage. After making this batch, I did even more research (or squirrel chasing as the case may be) and found this website Make Sauerkraut. I have added her blog to my reading list. 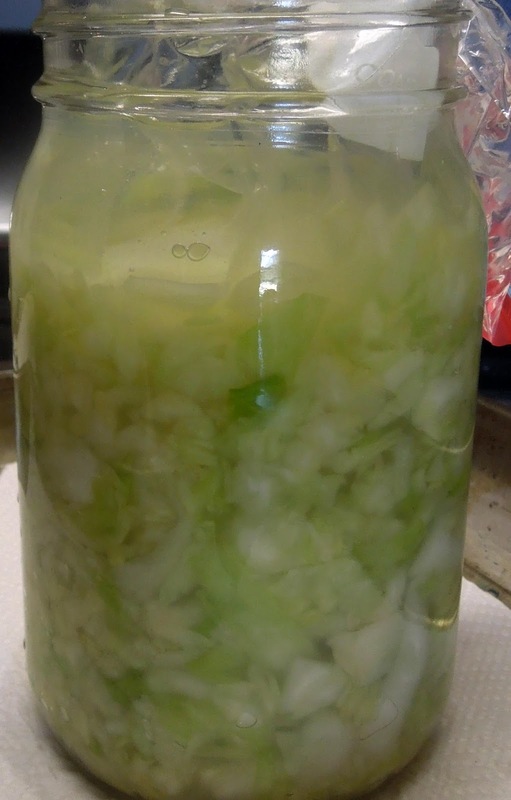 But after reading more, now I want to make another batch of kraut -or more. I saw so many variations on kraut that all sound good to me. There is a lot of information on the internet about eating fermented foods. 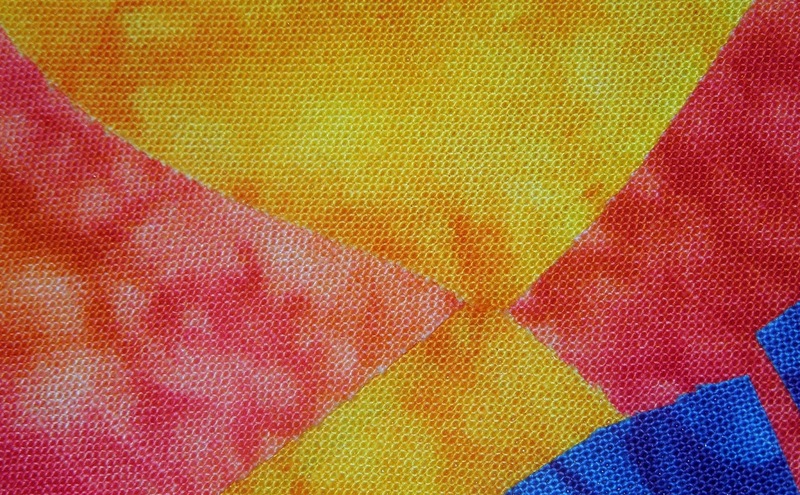 And I also have a mini-quilt that I have started but can't show - well okay, just a sneak peek. I am trying Heat 'N Bond light as the fusible for this one. It is made by Thermoweb. I really like it so far. In fact, I decided to become an affiliate for them. So, if you click on the banner and make a purchase I should get a small dividend. I really had no clue about the myriad of product that they make until I joined the program. I really want to try the iCraft Deco Foil. It can be used on fabric and/or paper. So it is also good for scrapbooking, card making or whatever else you come up with. I am not a big cooked cabbage fan but if you like sauerkraut then heads up. Sounds like fun. I used to love sauerkraut but it had to leave my diet with every other chlorophyll containing plant.